Will familiarity breed contempt for Devils, Hurricanes? Seeing the New Jersey Devils tangle with the Carolina Hurricanes is becoming a regular rite of spring in the Stanley Cup Playoffs. This is the fourth time since 2001 they have met in the postseason. Amazingly, it is the upstart Hurricanes -- and not the perennially powerful Devils -- that hold a 2-1 advantage in this series. New Jersey won the first matchup en route to the Stanley Cup Final in 2001, but lost to the Hurricanes in both 2002 and 2006, when Carolina marched all the way to the Cup. The team holding home-ice advantage has won all three series, which bodes well for New Jersey, especially when you consider that the Devils have lost six consecutive playoff games at RBC Center, including three in overtime, and failed to win a road game in the past two playoff series between these teams (0-6). Carolina, meanwhile, can take further solace in the fact that it defeated the Devils in the first three games of the 2008-09 season series before New Jersey took a cosmetic victory in the final game of the season -- a game that meant nothing to either team in the standings. This should be an entertaining series. Each team presents similar characteristics. If this season's history is a barometer, we can expect low-scoring, virtually penalty-free contests that will be contested at high speed. These aren't the boring, trapping Devils of yesteryear. This team will attack at will -- it's fourth in the League with 32.9 shots per game -- without sacrificing the solid defensive core that has become the team's trademark in the past 15 years. New Jersey's first line might be among the best units in the postseason. Plus, there's a ton of veteran depth here. Patrik Elias sees second-line minutes despite being the franchise's all-time top scorer. Bobby Holik, Brendan Shanahan, John Madden and Brian Rolston all have a ton of big-game experience. club's MVP this season by team captain Rod Brind'Amour, has found success alongside Jussi Jokinen (27 points) and Chad LaRose (19 goals). Jokinen's ability to fill in at different spots -- most notably as second-line center in Matt Cullen's absence -- played a key role during the club's late-season surge. Brind'Amour (51 points), whose inspired play also assisted in Carolina's quest for its first playoff berth since winning the Cup in 2006, centers Sergei Samsonov (48 points) and Scott Walker (15 points) on a third unit. Late in the season, the Canes went on a franchise-record 12-game home winning streak during which they outscored their opponents 51-17. The Devils don't have the big-time stud who so often has dominated their blue line in the postseason, but New Jersey's collection of "no-name" defensemen is more than just competent. New Jersey allowed just 207 goals this season, and three of its six regular defensemen have ratings of plus-20 or better. Paul Martin is the team's major offensive threat (33 points) and he sees the most ice time. But newcomer Niclas Havelid, especially on the power play, and Mike Mottau can pitch in with some points. The underrated Johnny Oduya had 29 points. Colin White and Bryce Salvador are the kind of bangers who can make opposing forwards miserable during a long series. There's no question the addition of Joe Corvo midway through last season provided a shot of adrenaline to the transition game for the Hurricanes; just the remedy for a lack of production from the back end. Corvo, who is paired with Tim Gleason, leads the defensive unit with 38 points (14 goals, 8 power-play goals). Joni Pitkanen (33 points), Anton Babchuk (35 points), Niclas Wallin and Dennis Seidenberg (30 points) are the team's other defensemen. In 82 games this season, Carolina's defensemen have accounted for 45 goals and 172 points, as compared to the 20 goals and 133 combined points from defensemen in 2007-08. But this unit is not all about offense, gelling in its own end in the past few months. Prior to the All-Star break, the Hurricanes were No. 24 in the League with a 2.89 goals-against average. But in the past 34 contests, they've yielded 82 goals to catapult to eighth in the League at 2.70. Martin Brodeur returned from his four-month injury layoff to cruise to the all-time wins record. He's pushed the mark to 557 and counting, though there was a bit of a letdown after he passed the mark. But with three Stanley Cups, is there a better big-money goalie around? He finished the season 19-9-0 with a 2.41 goals-against average and .916 save percentage. Fourth-year goalie Cam Ward is white-hot heading into the postseason. He was 10-1-2 with a 1.98 GAA and .938 save percentage in 13 games in March to help spark the Hurricanes to a playoff berth. Ward finished the season 39-23-5 with a 2.44 GAA and .916 save percentage. Brent Sutter got a difficult first taste of the Stanley Cup Playoffs last season as his team went out in five games to the Rangers. Sutter was masterful in guiding the team through Brodeur's absence, but he'll really be judged by how he does in the postseason. Since Paul Maurice replaced Peter Laviolette on Dec. 3, the Hurricanes have fashioned a 33-19-5 mark. The club also has made a concerted effort to play better defensive hockey in its own end, as evidenced by the fact it has allowed three-or-more goals in only six of the final 18 games of the season. "I'm proud of the way we've played the last month. We had a little meeting 20 games ago and we kind of said, 'Let's start our playoffs now.' You don't want to put too much weight in that, but we seemed to kind of bear down from then on. We've gotten great goaltending and that has been the difference. Cam (Ward) has just been real solid and has allowed us to make mistakes and we're getting just timely goals. It's a fun time to play again." Zach Parise's 14 power-play goals lifted the extra-man unit from poor (15.6 percent last season) to good (18.9 percent) this season. Their point men won't scare anyone, but the Devils are very creative down low. The penalty kill has struggled (79.9 percent), but the Devils average only 12.9 penalty minutes per game. Team has done little to distinguish itself on either PP or PK. Power-play is ranked No. 14 with a 19.5 conversion rate. Zach Parise leads all PP scorers with 18 points. John Madden is best killer on man-short unit that ranks No. 20 with a 80.3 percent success rate. Brian Rolston, New Jersey -- Lou Lamoriello did not sign Rolston to provide 15 goals and 32 points. Much more was expected from the smooth-skating veteran forward. But there is still time for redemption, and Rolston has the tools to star in the postseason. He is still a world-class skater with a potent slap shot who can play any forward position, as well as run the point on the power play. If he gets going in the postseason, he will give New Jersey forward depth that will be tough to counter. 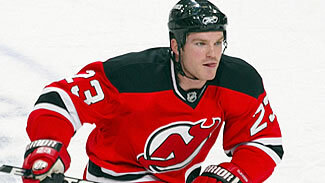 New Jersey will win if: Martin Brodeur is the goalie he was when he first came back from his four-month layoff. Brodeur was virtually unbeatable for the first three few weeks after his return -- passing Patrick Roy for the all-time wins mark much earlier than anyone expected. When Brodeur is on top of his game and playing with confidence, he is almost unbeatable. Carolina will win if: It continues to receive a lot of scoring from its blue line. These teams are mirror images of each other in so many ways. Each has a dominant goal scorer, each is middle of the pack when it comes to special teams, each has a Stanley Cup-winning goalie and neither takes many penalties. The one area in which they are notably different is production from the blue line, where Carolina has produced 45 goals, compared with New Jersey's 21.